I love Mexican food and chilli is one of my favourite dishes, but forever I’ve only ever made it using beef. It’s the traditional way and it’s definitely one of those ‘if it ain’t broke, don’t fix it’ kind of meals! However, that was before I discovered that Chilli Chicken was a thing and I simply had to try it. 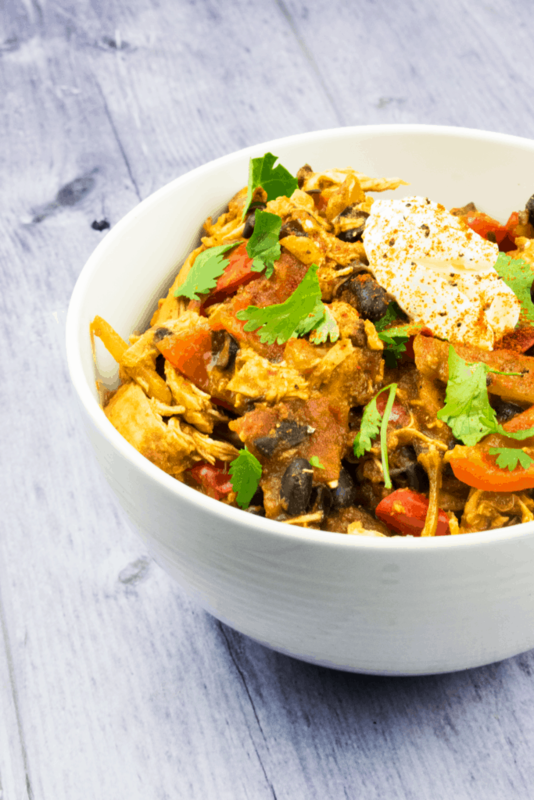 That’s when I came up with this Easy Peasy Low Carb Chilli Chicken recipe, which combines all of the delicious flavours of traditional chilli with lean chicken instead of beef. 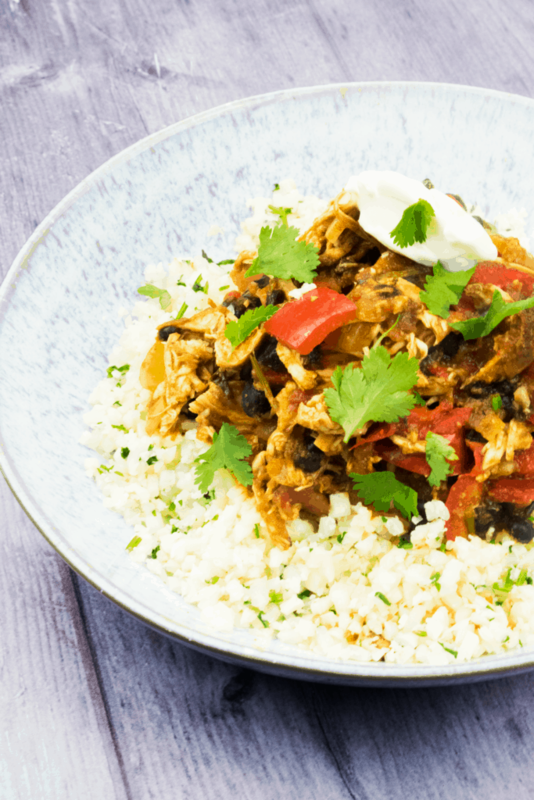 It’s packed with veggies, super low carb and high protein and literally bursting with flavour. You can eat it on its own, or enjoy it with some tasty Cauliflower Rice to keep things low carb! This recipe for Low Carb Chilli Chicken is not only a super tasty addition to your meal plan, it’s also totally Slimming World friendly. It’s entirely syn free, not to mention packed with speed veggies and it’s super high in protein with the chicken and beans. If you eat it with a side of cauliflower rice you’re adding even more speed to your meal and make it the ideal recipe to enjoy on an Easy Extra SP day to help boost your losses! 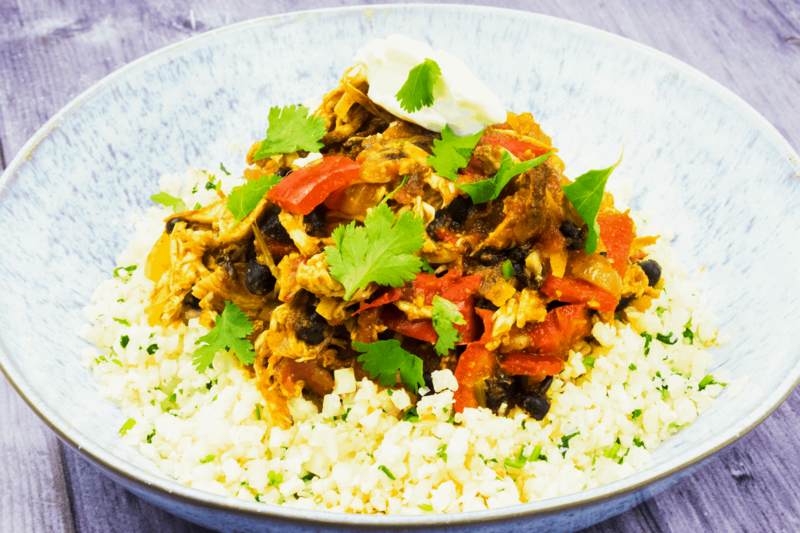 It’s also a very family friendly dish, which means you don’t need to cook multiple meals for you, your partner and your kids, the whole family can tuck in and enjoy a warming plate of Low Carb Chilli Chicken without feeling that they’re being too healthy! 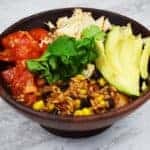 I have recently decided to try and bring elements of the Keto diet into my meal plans, primarily focusing on eating fewer carbs and sugar and more protein. 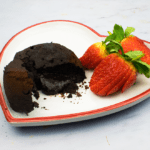 This recipe is a prime example of a recipe that is not only Slimming World friendly but also suitable for someone on the Keto diet! Whilst these two plans are obviously compatible, there is no need to do them both together, I’m just trying to boost my new year’s losses a tad. To that end, here is the breakdown of Macro Nutrients for this Low Carb Chilli Chicken, I have also included the calorie count, although I do not personally count calories. As you can see from the breakdown of macronutrients above, this recipe not only has a great ratio of carbs to protein, it also fits well within a limit of (for example) 20g of carbs per day. 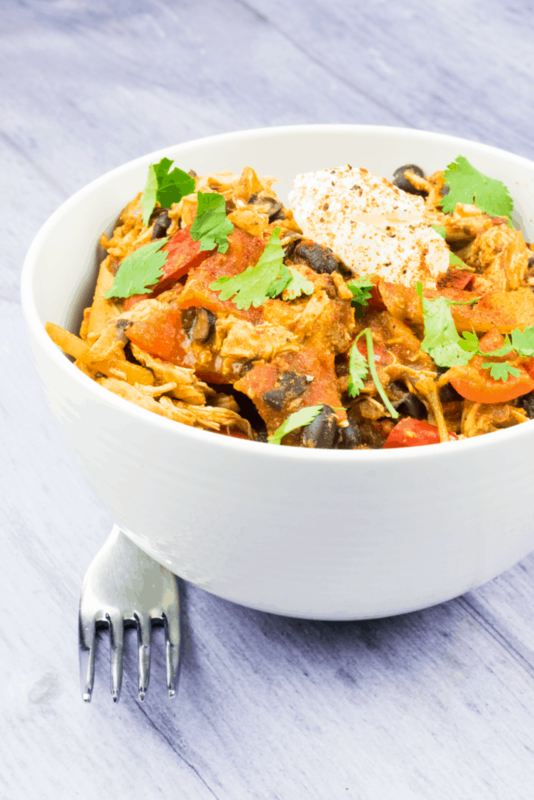 Anyone who follows the Keto diet will know that the quantity of different macronutrients you have during the day is very much a personal decision based on how your body reacts to carbs, but no matter what your daily breakdown is, this recipe for Low Carb Chilli Chicken should fall well within it. 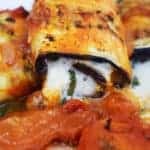 Not only is this recipe suitable for both the Slimming World and Keto diets, but it is also a fantastic meal prep dish no matter what your healthy eating structure is! Meal prep is an essential part of life for so many people who are trying to stay on the straight and narrow when it comes to eating. 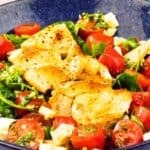 Removing the temptation to shop for unhealthy lunches or snacks at work can be an important factor when sticking to a healthy diet, so recipes like this come in handy! This recipe makes enough for six portions and can be kept in the fridge or frozen. 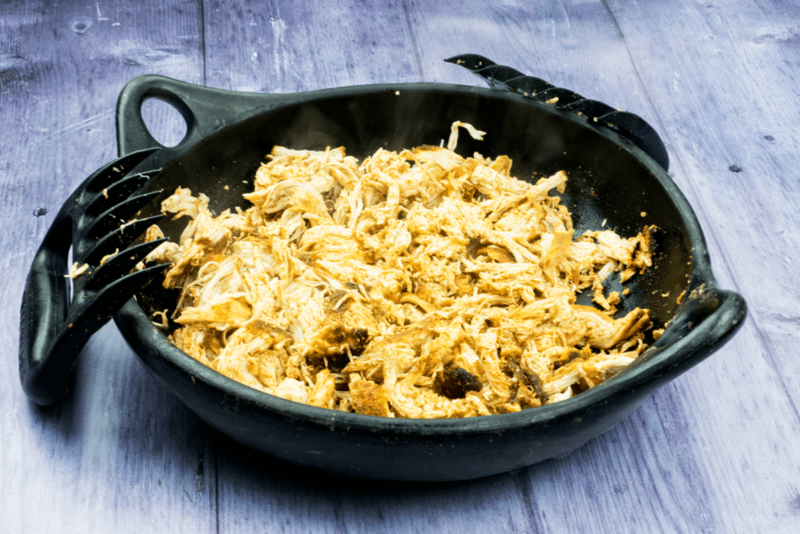 Although some people aren’t keen on reheating chicken, I personally have never had an issue with doing so (although please stick to what you feel comfortable doing) and this recipe would work perfectly with some microwave cauliflower rice or steamed rice which can be easily put together at work. No matter how you decide to enjoy this Low Carb Chilli Chicken, you can be sure that everyone else in the office will be getting jealous! I do hope you enjoy this recipe as much as I do, it has become a firm favourite in my house and I regularly make it for meal prep lunches. I’ve found that the trick to making this super juicy and full of flavour is to bake the seasoned chicken separately to the chilli sauce, and then shred it and add it in at the end. This keeps the chicken moist, adds another layer of flavour from the coating on the chicken itself, and saves time as you can have the sauce and the chicken on the go at the same time! 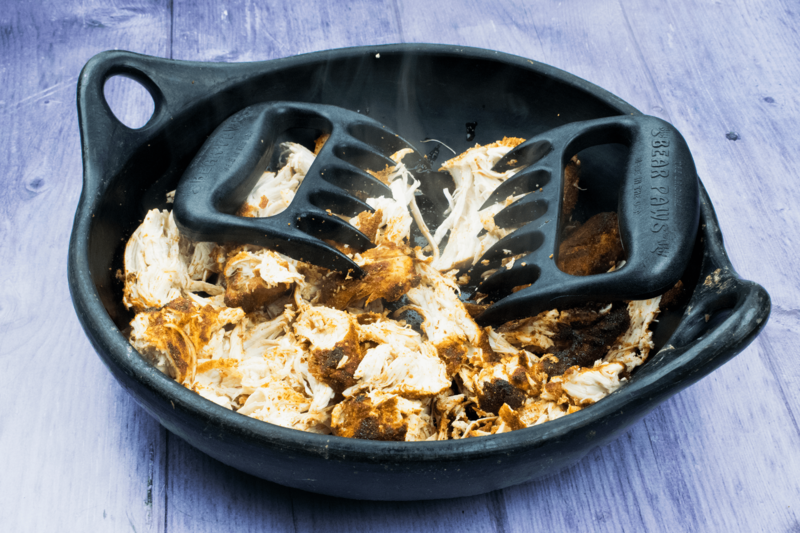 You can shred your chicken with two forks, or if you want to feel like Wolverine you can grab yourself a set of these Bear Claws which are not only super satisfying to use, but are way more effective than a pair of forks! 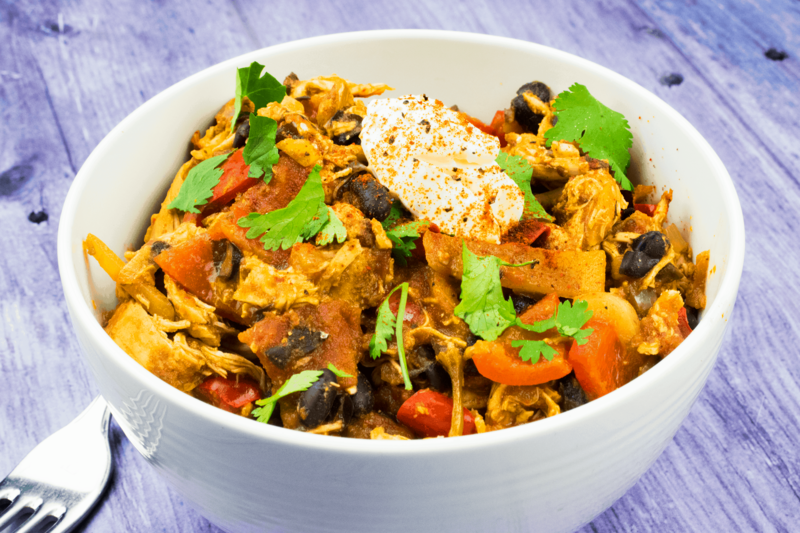 A delicious low carb chilli chicken recipe packed with flavour! Mix together the spices for the chicken and cover the chicken completely. Spray a baking tray with low calorie spray and place the chicken on to the tray, spray with some more cooking spray and pop them in the oven. Bake for 25 minutes, or until cooked through. Meanwhile, fry the onion and garlic for the sauce in cooking spray until the onions become translucent. Add your diced peppers along with the spices and fry until the peppers are softened. Add the chopped tomatoes, coriander and chicken stock and season to your taste. Cover and cook for 20 minutes on a medium heat and then uncover and cook for 10 minutes on high heat. Remove the chicken from the oven and shred it with your Bear Claws . Add the chicken to the chilli sauce and stir until totally combined. 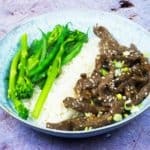 Serve with a sprinkling of coriander on its own or over some cauliflower rice! Syn free on Slimming World. Syn values correct at time of writing. Please do not share screenshots of this recipe, share links instead! DON’T FORGET TO PIN THIS RECIPE FOR LOW CARB CHILLI CHICKEN FOR LATER! This looks so good. I'll have to make this for dinner soon. Sounds like a terrific chili recipe, especially since it's so healthy! This looks,great. I particularly like that it is Keto ad well.